This post is in partnership with Atlantic Natural Foods. Thanks for supporting the brands that help make Bubby and Bean possible. Every Tuesday, without fail, my almost 5 year old daughter makes sure (multiple times) that we know it’s Taco Tuesday. And every Taco Tuesday, we make and eat tacos together as a family. 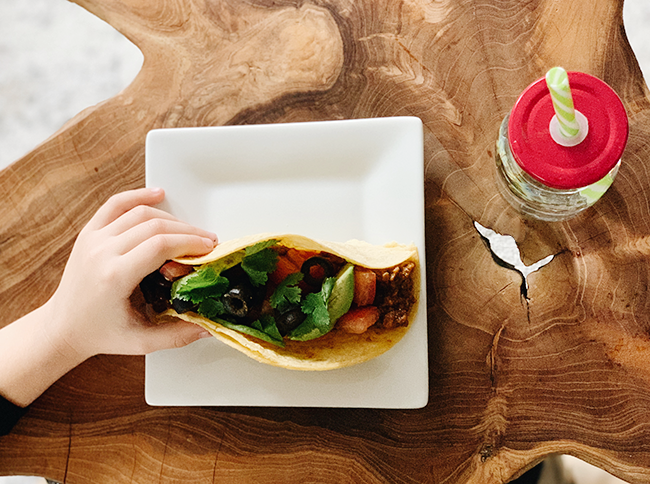 The entire process from cooking to eating the tacos is fun for all of us, but there are a couple of “challenges.” One is that we admittedly don’t have a lot of time on Tuesdays after work, school, and activities end. 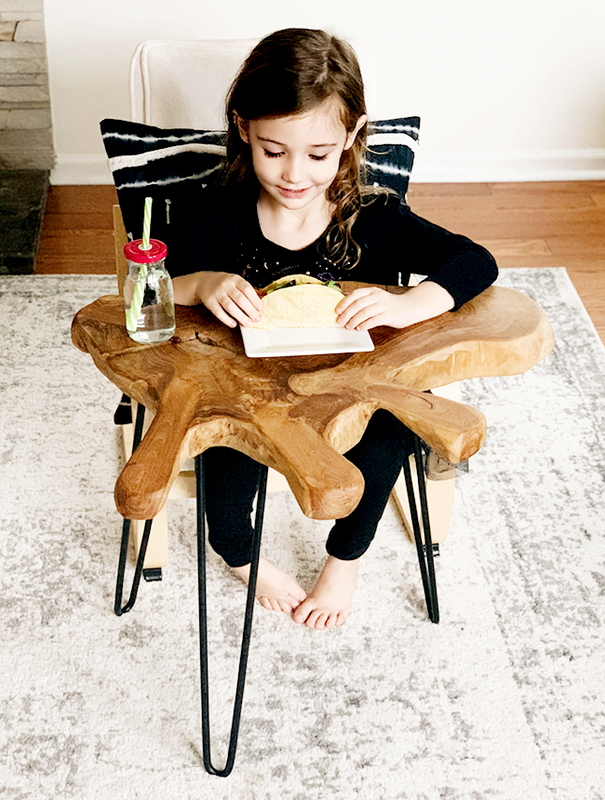 The other is that we have one vegetarian (me), one meat eater (my husband), and two littles ones who, like most young kids, have picky eating habits. 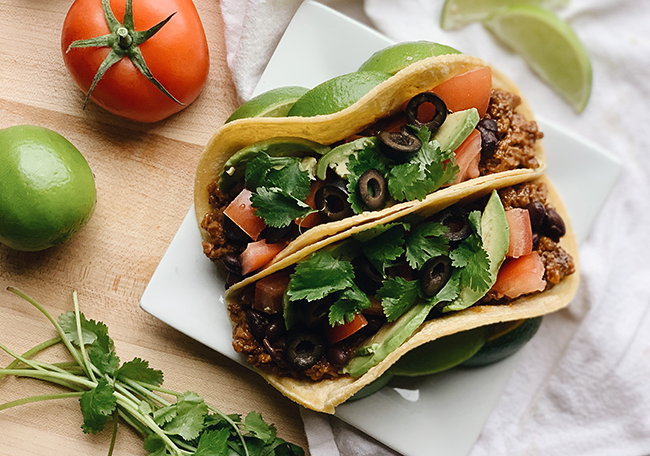 That means that in order to make Taco Tuesday a success, we had to come up with tacos we’d all love that also don’t take an excessive amount of time or effort to prepare. Thankfully, after some trial and error, we did just that. And since it is officially Taco Tuesday, it seemed like the perfect time to share our winning recipe with you! Heat Loma Linda® Taco Filling in the microwave according to directions. (It’s ready in 60 seconds, right from the bag!) Heat black beans in a sauce pan over low heat or in microwave for 2 minutes. Once fillings are heated, heat tortillas either in a hot frying pan for about 30 seconds on each side, or in the microwave for 20 seconds between damp paper towels. 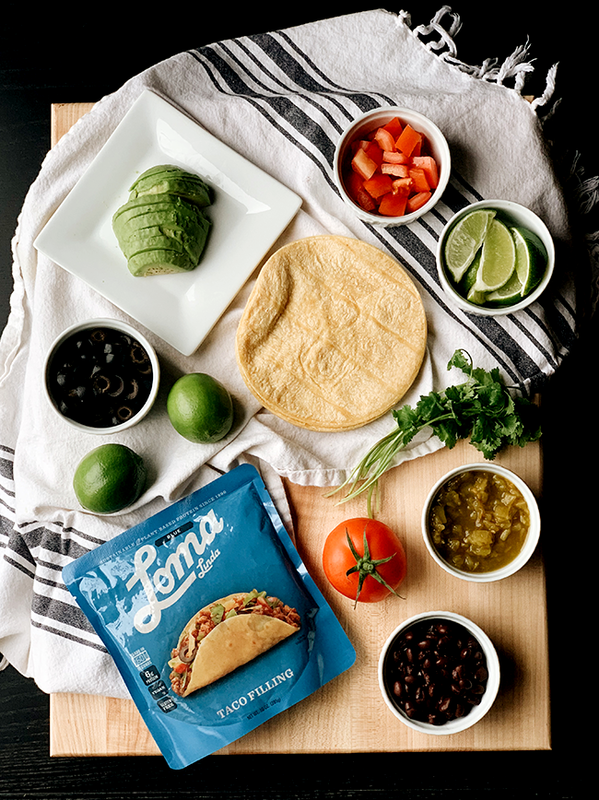 Fill tortillas with Loma Linda® Taco Filling and black beans, then top with tomatoes, avocado slices, black olives, green chilis, cilantro, and hot sauce (or any combination of those things), and squeeze a lime over the tip. Less than 10 minutes and you’re done! 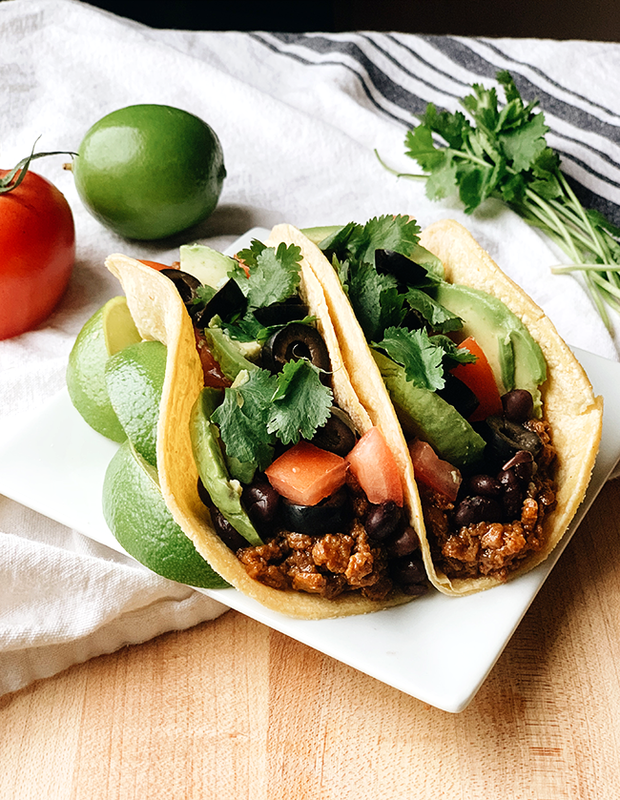 These tacos are incredibly delicious, and the different toppings allow for different family members to customize their tacos to their liking. 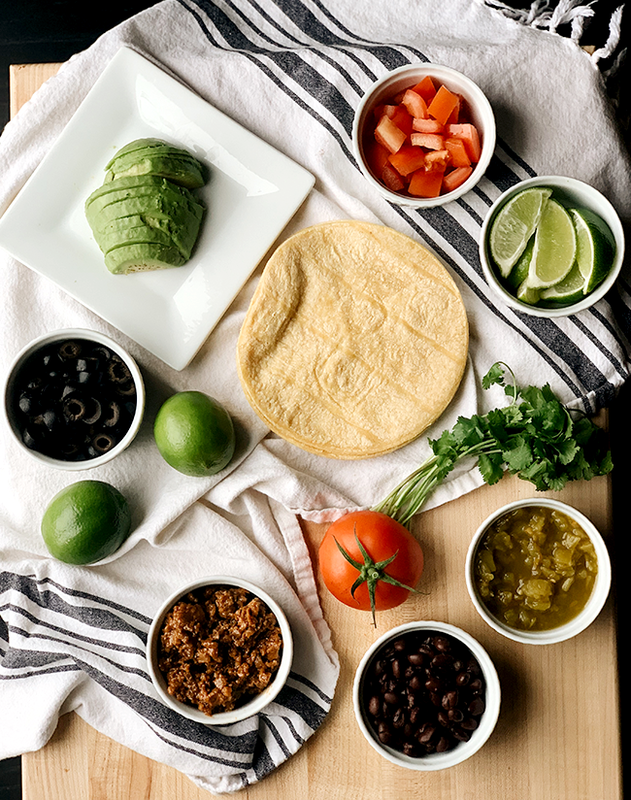 I use all of the ingredients (with very light cilantro), my husband leaves out the tomatoes, my daughter prefers just the Taco Filling, black beans, and avocado, and my son likes the Taco Filling, black beans, avocado, and black olives. We all get exactly what we want. But that best part of these tacos (tied with the easiness and yumminess factors, of course) is that they are completely plant-based. There is no meat, no dairy, and no egg. 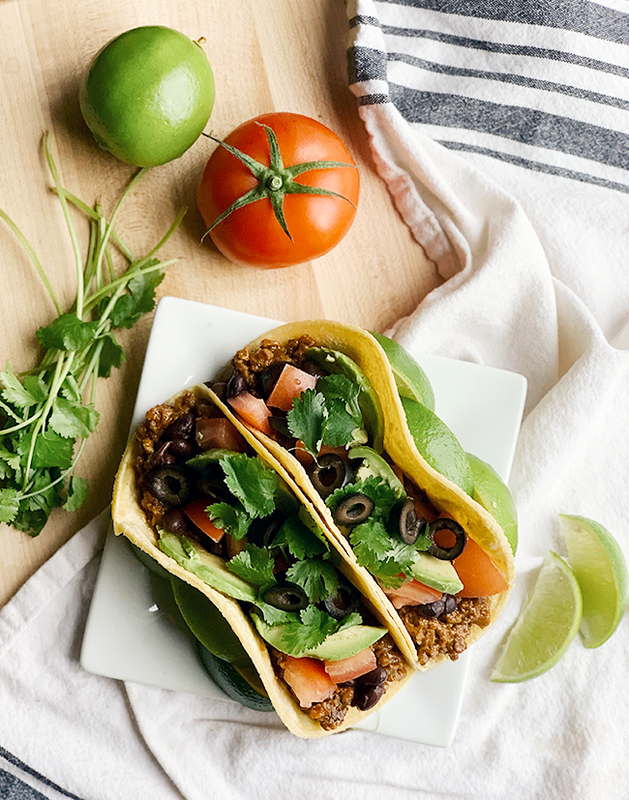 They’re packed with protein and so much better for you than the average taco. 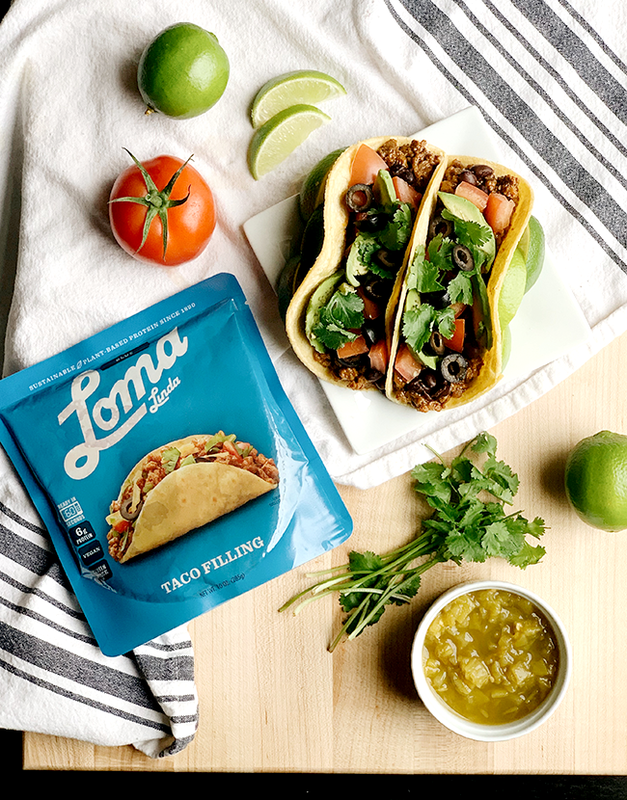 What makes these tacos so satisfying and delicious, in my opinion, is the Loma Linda® Taco Filling. I was recently introduced to it and instantly fell in love. I’m pretty picky when it comes to meat alternatives, but this stuff is the real deal. The texture and flavor are perfection, the seasoning is just right, and it could not be easier. I mean, you make a tiny tear in the bag, pop it in the microwave, hit 60 seconds, and it’s done. It’s completely shelf stable, so there’s no refrigeration or freezing required. My husband loves his taco meat, and says that Loma Linda Taco Filling is just as tasty, if not better. And it’s vegan, gluten-free, kosher, and non-GMO. 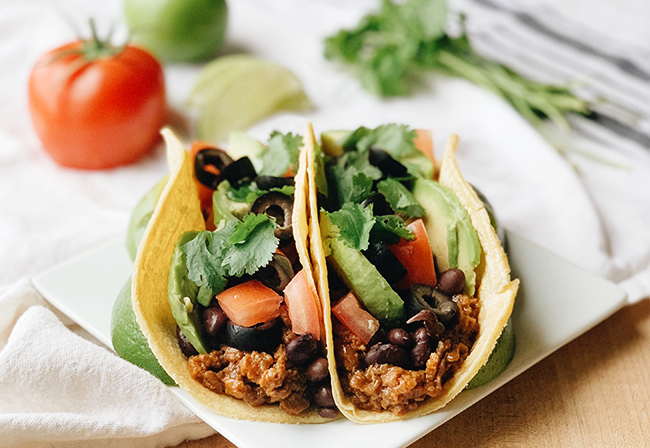 The Taco Filling is just one of several Loma Linda® Plant-Based Protein Meal Starters, a new line from Atlantic Natural Foods (a leading maker of better-for-you, shelf stable foods). The line features 10 different varieties of shelf-stable, plant-based versions of all the best comfort foods, from sloppy joes to chorizo. The Loma Linda line also offers Plant-Based Protein Meal Solutions – full meals including Spicy Pad Thai, Thai Green Curry, Tikka Masala, Mediterranean Tomato & Olive, Chipotle Bowl, Hearty Stew, and more. They’re all super easy to prepare in just 60 seconds, are packed full of 100% plant-based protein, and are incredibly affordable ($ 2.99 to $ 4.49). Better for you foods that take almost no time to prepare = my dream come true, guys. If you try this taco recipe, I’d love to hear what you think. Happy Taco Tuesday!